Victoria will take on Queensland for the 1st match of Aussie ODD Cup 2018, is going to be be played on 16 September, Sunday at Tony Ireland Stadium, Townsville. 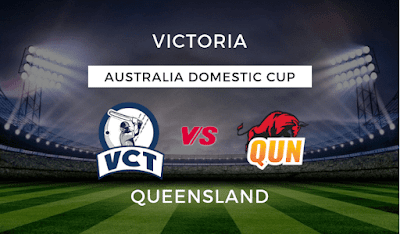 VCT Vs QUN Aussie ODD Cup Dream11 prediction is given in this post with all key stats. They will miss the services of Peter Siddle, Aaron Finch, Jon Holland due to their selection in Australia team. while James Pattinson is missing out due to injury. Marcus Harris and Cameron White will open the inning. G Maxwell generally bats at 1 down here. Usman Khawaja, Matt Renshaw, Michael Neser, Marnus Labuschagne and Brendan Doggett are on national duty. Joe Burn and M Bryant will open the batting. Their captain C Lynn will bat at 1 down. Charlie Hemphrey and S Heazlett are expected to bat in middle order.